Author's Note: Please forgive me for not having a column last week! I had one complete and ready to post, but an error caused it to be deleted. That, combined with being quite ill on Wednesday and Thursday, left me unable to rewrite the column. From now on, however, I'll be keeping copies on my local hard drive. The first major event of the year, the Manassters 2 Trek Masters Series event, takes place on Sunday, March 3rd. Hosted by Ben Hosp (bhosp) in Manassas Park, Virginia, the eleven (11) pre-registered players - a possibly others - will vie for the first championship title of the year. It's a tough field, with Michael Van Breemen (The Ninja Scot), Robin Honeycutt (robin1234), Austin Chandler (Darksabre) and Ben Hosp all in the Top 50 in the world. Brian Sykes, in 53rd, and Lucas Thompson, in 82nd, mean that over half the field ranks in the Top 100 players. But don't count out anyone else that's pre-registered, either! Mark Panna (Shambinks) is one of Robin's regular sparring partners. Phil Schrader (pschrader) has seen his 1E stock rising of late. Bruce Parrish (Captain Parrish) and Josh Sheets (prylardurden) are known to play odd or unusual decks that can throw curve balls, and DocJedi doesn't seem to have played much, but I never count anyone out. There's a discussion and predictions thread on the forums where you can weigh in on who you think will win. How will the removal of Quantum Incursions affect the deck choices? Or, did the ban come too late to let people change direction? 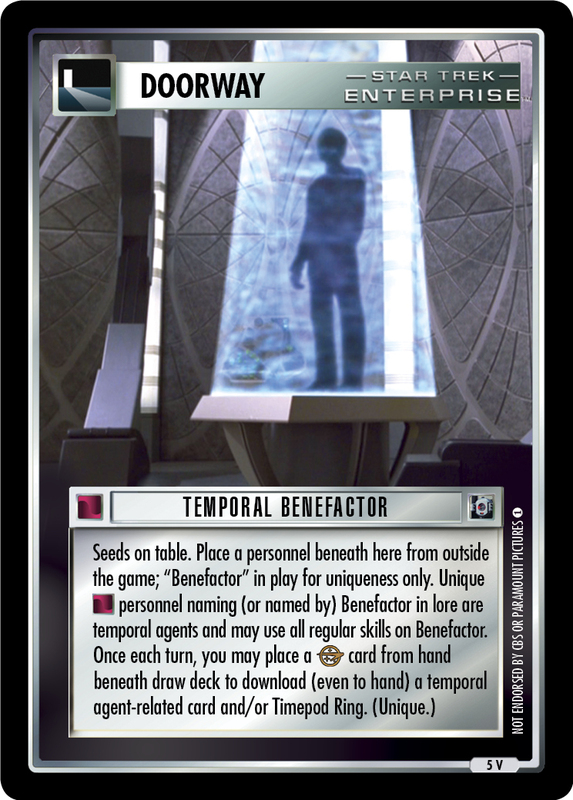 Will Temporal Benefactor and decks take the top spot? Or have people developed answers to these powerful decks? Next week, we'll find out. Four years ago today, a legend left this earth: Leonard Nimoy. The man who originated the role of Spock, famously proclaimed he was not Spock before growing to accept the role and declaring he was Spock, died on February 27th, 2015. Mr. Nimoy passed away at the age of eighty-three (83) from chronic obstructive pulmonary disease after a lifetime of heavy smoking. Nimoy played the role in two (2) series as well as eight (8) movies, and provided guidance and advise to Zachary Quinto who played Spock in the reboot movies. Ethan Peck, who will be playing Spock on Star Trek: Discovery, did not get the same opportunity. Rest in peace, Mr. Nimoy. Friday evening saw a "Sealed Warp Speed Voyager-logo Deck Lottery event (with a little bit of No Such Thing As Luck), because there's no technical limit on the number of weird formats you're allowed to smush together" event take place in St. Paul, Minessota, hosted by James Heaney (BCSwowbagger). Six (6) players played and swapped decks every round, with player Kevin (Kerlingonoas) coming out on top. This looks like it was a lot of fun, and is going to be part of a regular series of Friday-night tournaments - I can't wait to see more. On Sunday, there were tournaments on opposite sides of the United States. In Auburn, Washington, Michael Van Breemen (The Ninja Scot) played his Kazon Research deck to a win against host Justin Ford (Resistance-is-futile) and regular Richard DeLashmit (benericardus). The tournament prize was awarded based on differential, as all players had nine (9) victory points. In Brooklyn, New York, four (4) players enjoyed "excellent food and beer" and some First Edition where player Jules came out on top. All four players - Jules, Christopher Ghiorzi, Fire@Will, and Jack Johnson - appear to be new to CC-era play, which is incredible. Thanks for playing and reporting your results - we'd love to see your deck lists! Daniel Matteson's "PaQ Attack" online sealed event has ended, with Kris Sonsteby taking the top spot. His triple-treaty deck, called All You Gotta do is Say 'Earmuffs' to Him... is available to look at, as is Joe Kallstrom's. Those will be useful if you ever have a sealed event in your area. Kris came out on top of a three-way tie, again due to differential; Greg Dilon (Latok) and Austin Chandler (Darksabre) just narrowly missed the top spot. TK's (bosskamiura) event ended with Michael Van Breemen in the top spot, piloting a KCA deck called Another tournament, Another Thong... I mean Tong. The only other deck posted is also a KCA deck called You Turn Away... You're Back for More that Kris Sonsteby piloted to 3rd place. If you played in any events, scheduled or unscheduled, formal or casual, let us know! Send me an email or a private message, and I'll be happy to advertise your event or games to the world in a future column. My contact information is at the bottom of every column each week. While the Trek Master Series events are the biggest show this weekend, they aren't the only shows. Our Director of Organized Play, Kris Sonsteby (LORE) is running a league event on Saturday in Roseville, Minessota. Four (4) players are preregistered to play OTF Constructed, including Top 50 players James Heaney (BCSwowbagger) and Mr. Sonsteby himself. Robert Petersen (Hobie) and Justin Kaufman (CrimsonRavage) round out the preregistrations. Monday, 4 March, sees the kick off of another of Thomas Kamiura's (bosskamiura) online league events. This OTF Constructed event shows five (5) pre-registered players, with both Jon Carter (pfti) and Kris Sonsteby in the Top 10 worldwide. One thing to remember is that the first Monday of the month is when errata and ban list updates usually take place - keep that in mind! If you have tournaments coming up, feel free to schedule them in our tournament system so I can promote them in future articles. I've covered this weekends Manassters 2 event in today's headline (see above), but I wanted to let you know that starting next week, I will be taking over The Road to Worlds series (for First Edition) from Lucas Thompson (edgeofhearing). This series has long focused on the results of championship level events, and will continue to do so as part of this column. So stay tuned for next week's edition! Looking further ahead, "Spring Break Masters" on Saturday, March 30th will be the next championship level event to watch. Four (4) players will be taking part in the Silver Tin Draft sealed event. I have it on good authority that several other players plan on making the trip to enjoy the weather in Southern California, including yours truly. In future weeks, we'll bring you details on how the Sealed Silver Tin Draft works, and what you can expect. 2019 North American Continental Championships. Event coordinator and chief ambassador Michael Shea (The Prefect) has more details about the First Edition NA Continental Championships. The event will be on Sunday, June 23rd, at the JW Marriott Buckhead in downtown Atlanta, Georgia. You can pre-register for the event here, and join the six (6) players that have already done so. 2019 European Continental Championship. We might have to call that weekend championship weekend, as Sunday, June 23rd also features the First Edition European Continental Championships in Manchester, United Kingdom. The event currently features three (3) British players having preregistered, but there's plenty of time for mainland Europeans to challenge for the title. Will of the Collective. Excalbia is nearly complete, and Yarnek is not far behind! When this article goes live, you will have the chance to vote on the image for the mission, and submit ideas for complete lore for Yarnek. Follow the entire process in the master article, and don't hesitate to make your mark on these cards as the community design process marches to a conclusion. See how in-depth design discussions can go. Recently a discussion about "solvers" and game speed jostled the memory of First Edition volunteer and prolific author James Heaney (BCSwowbagger). With permission, he's posted an in-depth discussion about game speed and solver decks on the Deck Designs board. We invite you all to read it and see just how into the weeds design discussions can get! Traditional Decipher-era decks? Forum user MonkeyJamboree has been looking for Decipher-era decklists. The Continuing Committee supports this format, which we call Traditional, but doesn't have a lot of content for the format. There are a few good links in the thread, but if you have more, we invite you to participate! A discussion about note taking and deck help. A detailed discussion about taking notes during games and/or marking dilemma combos has been ongoing, and we want your input. In general, players have no problem with marking cards with colored dots to indicate dilemma combos or free plays, especially when it comes to kids playing. But officially, we don't have much documentation on the legality of such things. What do you think? Two-time Star Trek guest actor Morgan Woodward passed away. Thomas Morgan Woodward played two (2) roles on the original Star Trek: Dr. Simon Van Gelder in "Dagger of the Mind," and deranged Captain Ronald Tracey in "The Omega Glory." Neither character appears in First Edition yet, although there is a Second Edition of Captain Tracey. Mr. Woodward was 93, may he rest in peace. As my column was eaten by the digital grus last week, I'd like to reveal the two love-themed combo submissions I got for my Valentine's Day contest. First was Corbin Johnson (corbinq27), a veteran 1E player, former 1E designer, and all around outstanding human being. His favorite combo is leading off with Female's Love Interest & Garbage Scow, following it with Talosian Cage, and finishing with Matriarchal Society. I hope you have Christopher Pike or a whole lot of females to get past that! The second submission was from First Edition Errata Manager Matthew Zinno (commdecker), who likes to throw this gender-related combo in his capturing decks: Socializing with the Staff, then Kidnappers, then Matriarchal Society. I like that, and I will be stealing it. I've decided to declare both of you winners, and will be sending each of you a care package. Expect some private messages from me shortly, and your prizes in March! Last week, we kicked off a tournament to determine which 1E card will reign supreme. Sixty-four (64) cards enter, but only one card will leave! There were a few upsets in the first week, mostly when a referee card was seeded against a non-referee card. Will there be similar upsets in this week's Beta and Gamma quadrant voting? Click here to cast your votes, and don't forget to enter your email address for a chance to win a complete set of Tournament Promo Series N!